"Buildings - Civic - Libraries"
Photograph of (Mrs.) William Beck, Grace McGill, and Lois Stevenson each holding stacks of books at the opening of the McGill Annex. Photograph was originally mounted in a booklet style folder, with a stamp on the recto that reads: "BURNABY PUBLIC LIBRARY FOR REFERENCE USE IN LIBRARY ONLY" a stamp in the interior that reads: "COMPLIMENTS VANCOUVER DAILY PROVINCE" and a stamp on the verso that reads: "Bill Cunningham, Vancouver, B.C." 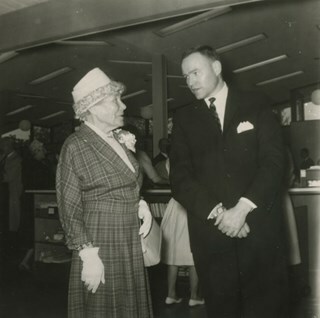 Photograph of Grace McGill & Reeve Allan Emmott at the opening of the McGill Branch. 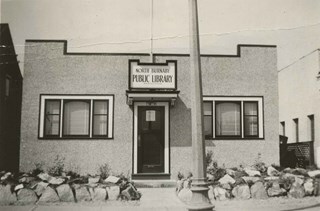 Photograph of the North Burnaby Public Library at Hastings Street and Gilmore Avenue, the first North Burnaby Public Library. 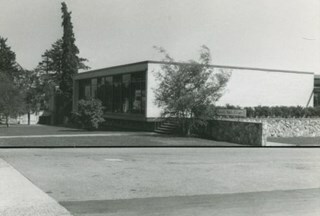 Photograph of the North Burnaby Public Library at Hastings Street and Gilmore Avenue, the first Burnaby Public Library. 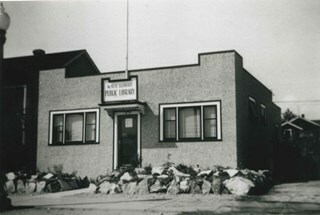 Photograph of North Burnaby Public Library under construction at Hastings Street near Gilmore Avenue. 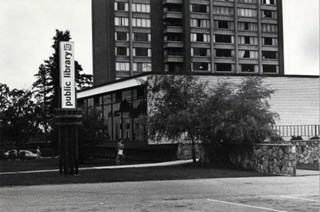 Photograph of the Kingsway Branch of the Burnaby Public Library. 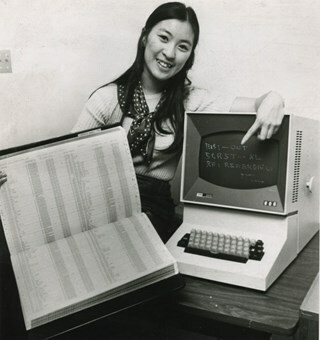 Photograph of Jo-Anne Lee, 7th semester arts student and Simon Fraser University library assistant as she points to the cathode ray tube display station (CRTs); part of the "first computerised on-line library loan system in Canada" which gave instantaneous information on the status of any book. In her other hand she is holding up a logbook of computer print out sheets which formerly kept track of library check-outs and returns. 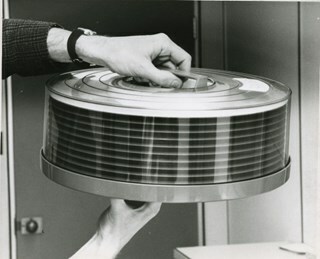 Photograph of an IBM storage disk which "holds all the information on the circulation of SFU [Simon Fraser University's] 300,000 volume library, ready for instant retrieval" and is part of the "first computerised on-line library loan system in Canada". 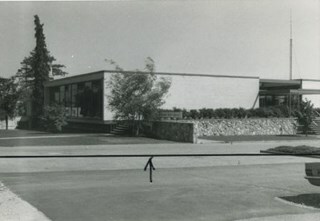 Photograph shows the Kingsway Branch of the Burnaby Public Library, located at 7252 Kingsway. 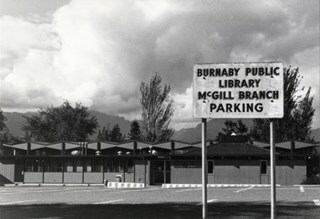 Photograph shows the parking lot and back view of the McGill Branch of the Burnaby Public Library taken from Albert Street. The front is on Pandora Street. 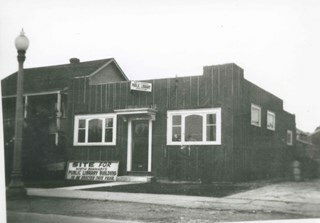 Photograph of the store at 4147 Hastings Street that was used to house the North Burnaby Library from 1935 to 1939. 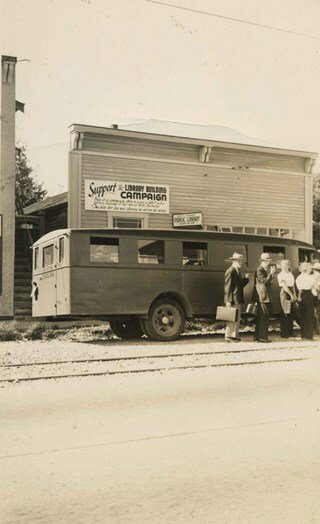 Men and women are seen climbing onto a large bus that has been parked in front of the store. 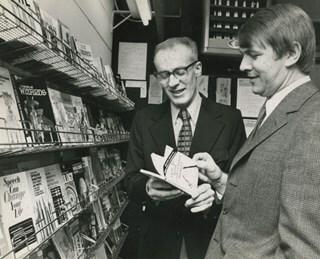 Photograph of Bob Prittie with Chief Librarian Bryan Bacon at "Burnaby's new public Library branch" Crest Neighbourhood Library. 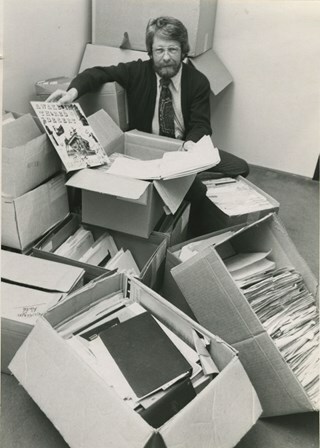 Robert W. Prittie was New Democratic Party's Member of Parliament (MP) for Burnaby-Richmond from 1962 to 1968. 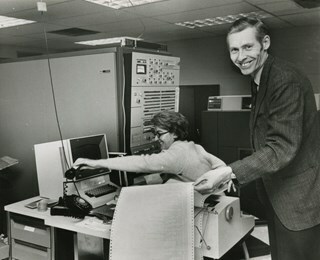 He was a Burnaby Councillor from 1959 to 1962, and served as Mayor of Burnaby from 1969 to 1973. Newspaper clipping attached to verso of photograph reads: "Burnaby Mayor Bob Prittie eyes an appropriate book, How to Avoid Unnecessary Surgery, following opening ceremonies at Burnaby's new public library branch Crest Nieghborhood [sic] Library in Crest Shopping Centre. At right is Chief Librarian Bryan Bacon. (see column item).